UPDATE: On July 9, 2013, Genesis One, Inc. issued a second press release and as of this update (3 weeks later) that press release had received over 13,000 views. This shows that the approach that Genesis One used can produce repeatable results. In other words, the huge amount of traffic that their press releases are receiving is not a fluke, but a result of the supporting actions of Genesis One. Anyone who is truly interested in increasing visibility and recognition for their company should pay very close attention to the methods described below. On June 4, 2013, Genesis One, Inc. issued a press release via eReleases / PR Newswire to announce a new product, the T-SQL Source Code Unscrambler. Wait – what on earth does a “T-SQL blah blah blah” have to do with me? If that product sounds difficult to understand to you, I agree! But this story is not about the product. Instead, it’s about what happened with this one press release. And it can apply to anybody. GenesisOne got some truly great results, including over 20,000 visits to the release (most of them on the version published on eReleases.com, which you can see here), and over 50,000 visits to their own site. Our release of GenesisOne T-SQL Unscrambler was a major milestone for our company, for which we have been planning for quite some time. Prior to release of the product we’ve set up various social networks (Facebook, Twitter, LinkedIn, Digg, Google+ and more). We have also joined a number of relevant Networks, Forums and Online Groups, relevant to SQL developers and software project managers. In addition we have prepared an email list of potential targeted customers that we have been in discussion with throughout the development stage. Lastly, we had an internal memo sent out to all of our team members about the launch. 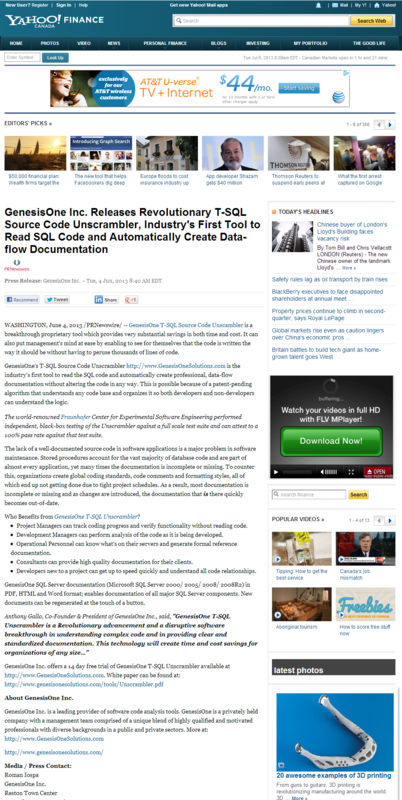 As GenesisOne T-SQL Unscrambler Release news came out live via eReleases – we went to work! We asked all of our team members to email and share the news with their personal networks and friends. We submitted this news to our company social networks and groups. We emailed the news to our potential clients and investors. We sent this release to a number of editors within the industry. Since eReleases provided a list of sites where the release was syndicated (close to 400 in our chosen categories) we visited these sites and either Liked via Facebook and re-Tweeted, +1’ed..etc., each and every site. Getting such great reviews by the third party media is priceless and is a major reason why a company of any size would and should put out a press release. As a side note: the eReleases team (Hi, Allison) was great in helping us to set up our first and second release and despite the fact that I’m pretty familiar with online PR world – their help surely added to our success. I strongly suggest to all companies large or small to take advantage of this service and not to undermine the power of press releases…. Let the clients find you!!! But don’t just put out your pr and sit back – we didn’t and got close to 50,000 hits to our website and 20,000 hits to our press release on eReleases. Roman Iospa, CMO GenesisOne Inc.
Wow, this company really “gets it”. So many of our clients send one or two press releases, and after they just sit back, and their business is not transformed, they decide that “press releases don’t work”. One-shot success like that rarely happens. Roman understood that, and he created a great plan to do everything possible to build on his press release. Will this type of practice make every press release a resounding success like this one? Almost certainly not. But doing what Roman did, and understanding that getting the word out to media is an ongoing process, not a single event, will greatly increase the odds of achieving PR success. This press release is hosted permanently on eReleases.com, so Genesis One can continue to receive traffic for week, months, and years into the future. And as they build their press release strategy in the future, the GenesisOne eNewsroom ( https://www.ereleases.com/pr/author/genesis-one ) will also attract traffic and provide an excellent company news summary in coming months. 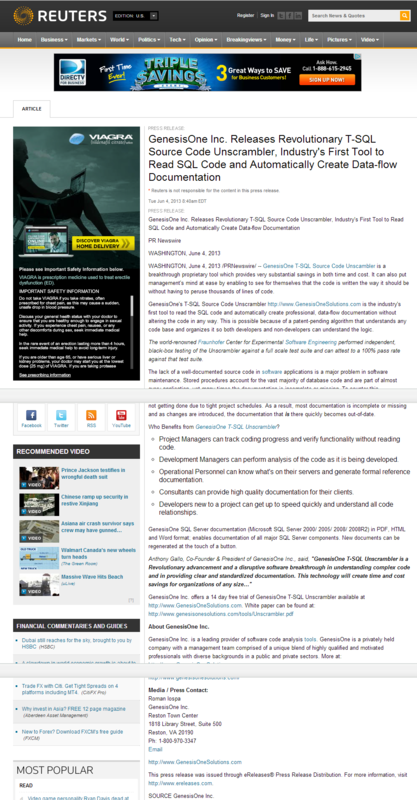 (Click each thumbnail above for direct access to the press release on the news site itself.) 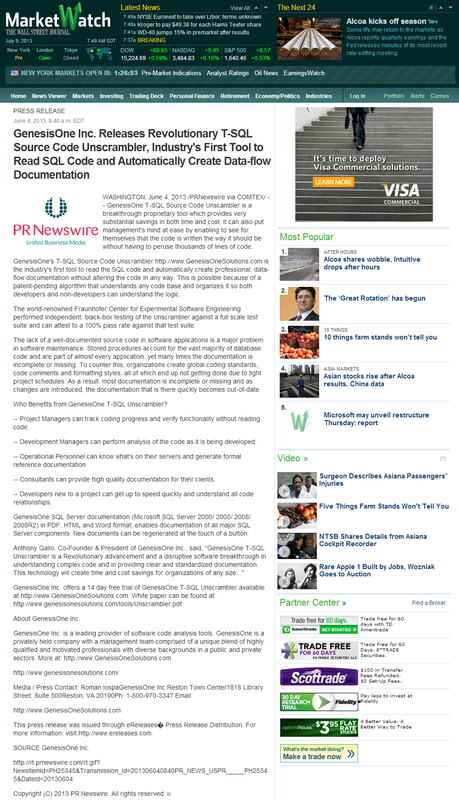 GenesisOne’s press release reached hundreds of newspapers and journalists. More than 300 of them picked up the GenesisOne release and published it on their website. This can bring instant publicity, and better, credibility, for just about any business. For anyone interested in boosting their brand or creating traffic, that’s worth a lot! GenesisOne’s press release was able to get massive attention, traffic, and lots of buzz! How about you?